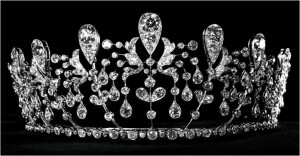 “Bourbon Parma tiara”, produced in 1919 for the wedding of Edwige de la Rochefoucauld to Prince Sixtus of Bourbon Parma, demonstrated exceptional techniques. 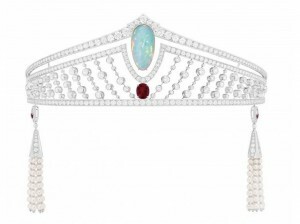 Chaumet tiara in platinum diamonds set with cabochon -cut white opal and Burmese pigeon’s blood ruby. Pendants in platinum, diamonds, cultured pearls and rubies. The pendants can be attached to the back or front of the tiara or detached and worn as earrings. 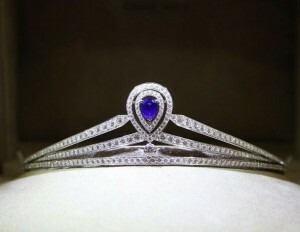 Josephine tiara in platinum, paved with brilliant-cut diamonds, set with pear-cut sapphire.